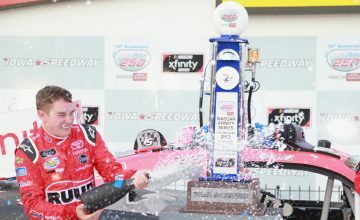 The Verizon IndyCar Series descends upon Iowa Speedway this weekend and one driver in particular is looking to continue his dominance at the 7/8-mile track. Ryan Hunter-Reay is the defending race-winner of the Iowa Corn 300 and has won three of the last four races at the track in Newton, Iowa. The Andretti Autosport team, for which Hunter-Reay competes, has won seven of the nine races at the track dubbed “The Fastest Short Track on the Planet.” Hunter-Reay (2012, 2014 and 2015) joins Tony Kanaan (2010), Marco Andretti (2011) and James Hinchcliffe (2013) in a stretch of six straight Andretti Autosport victories at the track. “It’s just a blast to drive that track. It’s one of the most physical tracks we go to – we pull 5 Gs (G-forces) in the corners there,” Hunter-Reay told Rubbings Racing this past week when discussing the upcoming race weekend at Iowa Speedway. Hunter-Reay is very familiar with tires at Iowa as they were the key to his victory in 2014. Under the final caution of the race, Hunter-Reay took four fresh tires while the leaders stayed out. When the race returned to green with just eight laps to go, Hunter-Reay charged through the field from the 10th position to earn the victory. While Hunter-Reay said it “felt like a video game” during his post-race interview after the 2014 victory, last year’s win is the most memorable to the 35-year-old driver. Hunter-Reay went on to finish seventh, first and second in the final three races of 2015 after the victory at Iowa and gained valuable positions in the championship standings, finishing sixth. 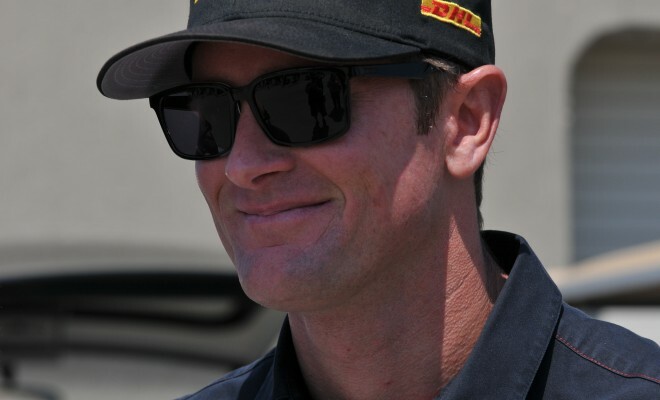 This season, Hunter-Reay heads to Iowa on the heels of several solid results, finishing on the podium at Belle Isle and fourth at Road America in addition to running strong before the race at Texas Motor Speedway was postponed. The third-place finish in the second race at Belle Isle tied Hunter-Reay’s best finish of the season. Hunter-Reay, the 2014 Indianapolis 500 winner, appeared to be on the way to his second Borg-Warner trophy during the 100th running in May, leading a race-high 52 laps and outside of pit stops, never running lower than the second position. 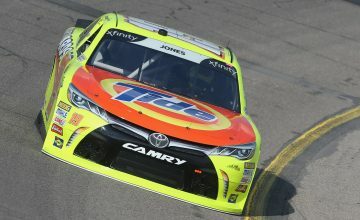 An accident on pit road just past the halfway point resulted in a 24th-place finish. While currently 11th in the championship standings, just six points separate Hunter-Reay and the seventh position, held by his Andretti Autosport teammate Carlos Munoz. The Firestone 600 at Texas Motor Speedway was postponed a day in June and then halted due to more rain after 71 of the scheduled 248 laps and will be resumed on August 27. Hunter-Reay was running second to leader James Hinchcliffe when the race was halted for the rain. Hunter-Reay has at least one victory every season since 2010 and has finished on the podium in every Iowa Speedway race since 2012. Does he have Iowa circled as the best shot to pick up that first victory of 2016? “Not necessarily. Obviously we see Iowa as a potential opportunity given our history there. So yeah, it’s something that we are looking forward to and we have to capitalize on it with the fact that we run pretty strong there.